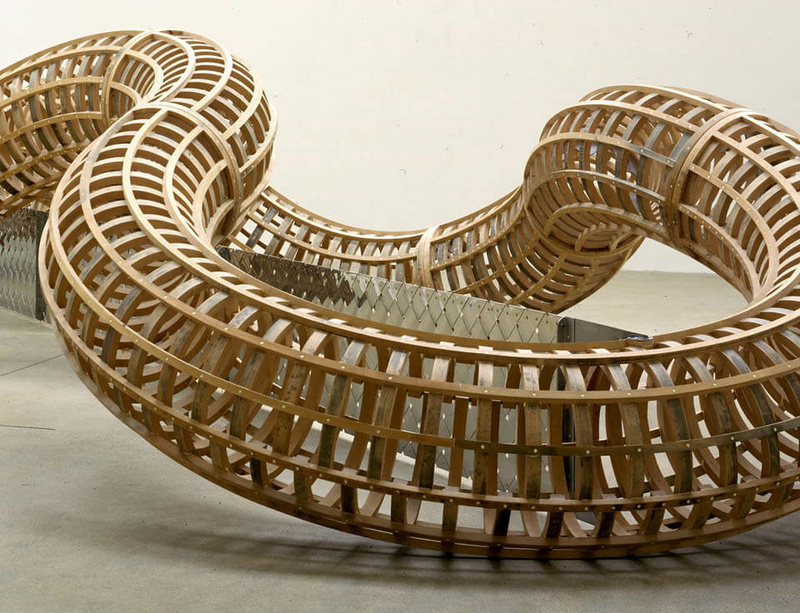 As one of Britain’s leading sculptors of the past 40 years, Richard Deacon has explored space, material, process and pattern through his use of sinuous bent wood, contorted steel and glazed ceramic. In addition to the traditional sculptural techniques of carving, moulding and casting, Deacon continuously experiments with radical approaches to the manipulation of solid matter by laminating, hammering, welding and hollowing out his works – describing himself as a ‘fabricator’ as much as an artist. Referencing not only architectural decoration, but industrial design and domestic furniture as well, Deacon’s objects seem to be simultaneously at home in their given environments, yet also totally out of this world. Tate Britain’s major survey of Deacon begins in the late 1970s, just as he was emerging from art school alongside other promising young sculptors, including Anish Kapoor, Tony Cragg and Bill Woodrow. A series of important early drawings based on Rainer Maria Rilke’s interpretation of the myth of Orpheus – whose songs lamented the loss of his love Eurydice – reveal Deacon’s ongoing sensitivity to the written word and to philosophical thought, while prefiguring the flowing ribbons and coiling contours of later works, such as the monumental, snaking forms of Blind Deaf and Dumb A of 1985. From the linguistic and poetic, Deacon’s practice shifts to the organic, culminating in the fluid lines of the wooden lattice snake of After, from 1998. A profound engagement with structures of a social kind can be found in the series called Art for Other People of 1982, which were small sculptures made from combinations of leather, marble, rubber and stone, originally meant for display in the home and as portable assemblages to travel from one place to the next. At the other end of the scale are the towering green ceramic stacks of Fold from 2012 – a sentry-like presence that acts as both entry-point and finale to the exhibition. Belying its sheer size, Fold reveals Deacon’s ability to tackle monumental commissions and the challenge of public sculpture with an entirely human sensibility. Like his infinitely varied work – represented by 40 examples shown in the lower galleries of Tate Britain, ranging from 1976 to the present day – Deacon cannot himself be pinned down to one style or subject. Only the principles of draughtsmanship, an emphasis on hands-on experimentation and a radical use of colour are constants throughout his career, while in that time he has also been lauded as a distinguished educator, as the winner of the Turner Prize in 1987 and as a Royal Academician.